The Tulsa Oilers hockey club recently signed four players to help fill out their roster for their preseason camp, expected to take place in the early weeks of October. Kyle O’Kane, Stephen Blunden, Max Grassi and Jeff Jubinville are the newest additions to the Oilers offense. Kyle O’Kane made his CHL debut with the Oilers during the 2012-13 season and is returning to Tulsa after spending the 2013-14 campaign with the St. Charles Chill. In 62 games with the Chill, O’Kane, 27, posted a team-high 22 goals and chipped in 14 assists to cap off his second season as a professional. 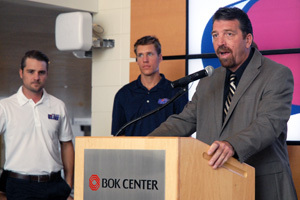 A native of St. Louis, Missouri, O’Kane played four years at Western Michigan University before turning pro with the Louisiana Ice Gators of the SPHL. After 11 games in Louisiana, the 5-foot-8, 182-pound right wing was called up to Tulsa where he became a fixture in the Oilers’ lineup. O’Kane recorded two goals and two assists in 29 games as an Oiler. In a year away from Tulsa, O’Kane says he has tweaked his game a bit. His coach has a very high opinion of the third-year veteran. Stephen Blunden comes to the Oilers from the University of Ottawa. In his final year at the University of Ottawa he posted 14 goals and 20 assists and sat 49 minutes in penalties. He played junior hockey with the Belleville Bulls (OHL), Ottawa 67’s (OHL), and Gloucester Rangers (CJHL). Of those junior league teams Blunden had the greatest i8mpact with Gloucester, his last season as a junior, with 22 goals, 68 assists, and 106 penalty minutes in 54 games. Over the summer he has been skating in Australia with the CBR Brave. He led the team in points with 36 goals and 32 assists in 24 games. Max Grassi is coming into his second season as a professional, after skating last season in Germany with the Weiden Blue Devils of the German Oberliga. In 39 games with Weiden, the 25-year old Grassi led his team with 24 goals and 53 points. Prior to playing with Weiden, Grassi played five seasons of junior hockey in the BCHL before embarking on a four-year college career at the University of British Columbia. Grassi, 6-foot-0, 197-pounds, recorded 20 points or more in each of his final three seasons at UBC and led the Thunderbirds with 25 points during his junior year. In 2012, Grassi scored four goals in the championship game of the IIHF Inline (Roller) Hockey World Championship to help Canada earn a gold medal in a 9-5 victory over Germany. A player who can play either on the left wing or at center, Grassi want to bring his game home to see where his skills rate. Jeff Jubinville is another rookie and he will begin his professional career as a Tulsa Oiler. Jubinville recently graduated from Bemidji University in Minnesota. In four years of play with the Bemidji Beavers he put up five goals and 10 assists in 38 games. During his freshman season of 2010-11, Jubinville played alongside current Oilers forwards Ryan Cramer and Drew Fisher. A product of Edmonton, Alberta, Jubinville played three seasons of junior hockey in the AJHL and one season in the NAHL with the Wenatchee Wild. The Oilers begin training camp on Monday, October 13 and will play exhibition games on October 18 in Wichita and October 19 in Allen. 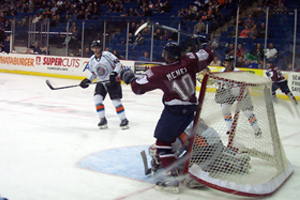 The 2014-15 regular season begins for the Oilers on Friday, October 24 with a visit to the Allen Americans. 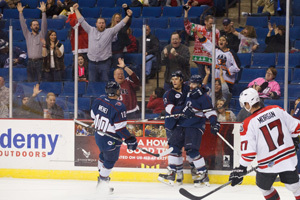 Tulsa’s home opener is slated for Sunday, October 26 at 4:05pm against the Wichita Thunder. This entry was posted in Sports on September 11, 2014 by admin.